This weekend I decided to try my hand at something I’d been thinking about for awhile. Soft tacos with brisket filling. I didn’t really have a recipe as such so I just kind of winged it. This is what I came up with. I threw a 2 lb beef brisket into the crockpot around 11 am and topped it with about 1/2 cup of catsup, 1/2 cup of brown sugar, 3/4 cup of tequila, 1 cup of beef stock, 1 TBS red pepper flakes, 1/4 tsp cayenne pepper, and 2 tsp cumin. I cooked it on high heat for about 3 hours and then reduced it to low for about another 3 or 4 hours. Once the brisket was done (super tender and falling apart!) 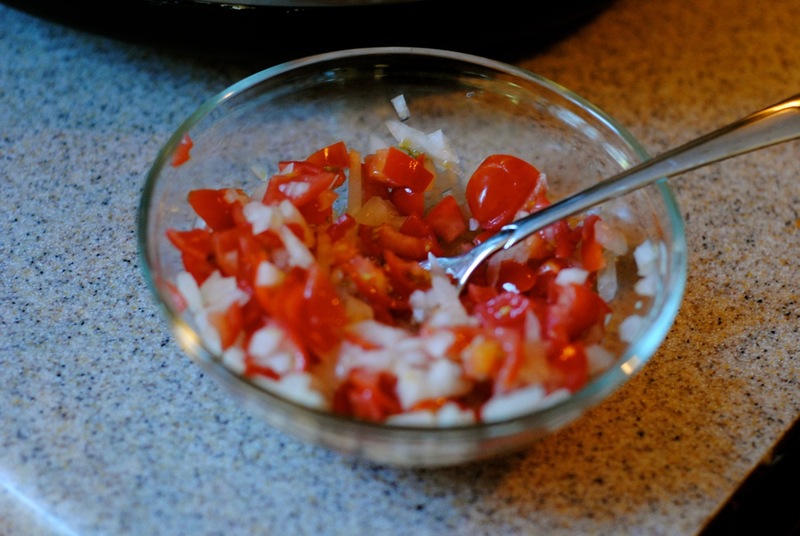 I chopped up some tomatoes and onions and threw them together in a small bowl with a splash of lime juice. If I’d had any fresh cilantro on hand I’d have thrown that in as well. 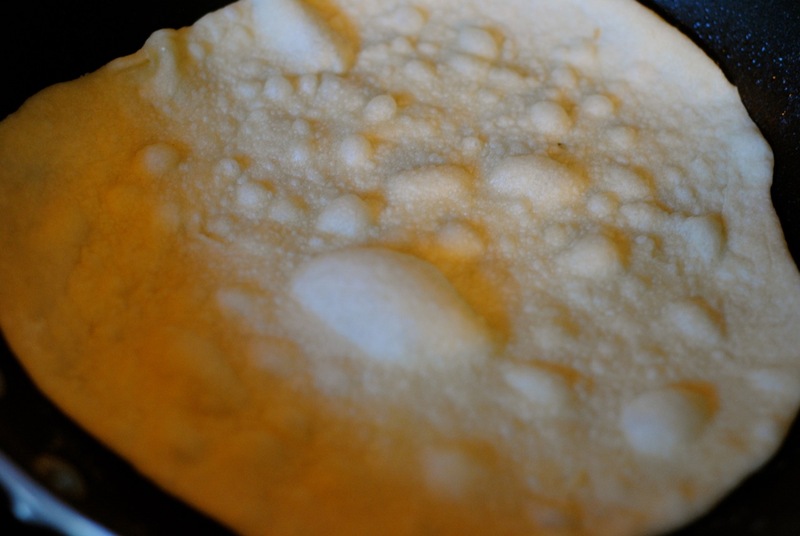 Then I decided I may as well whip up some homemade tortillas. 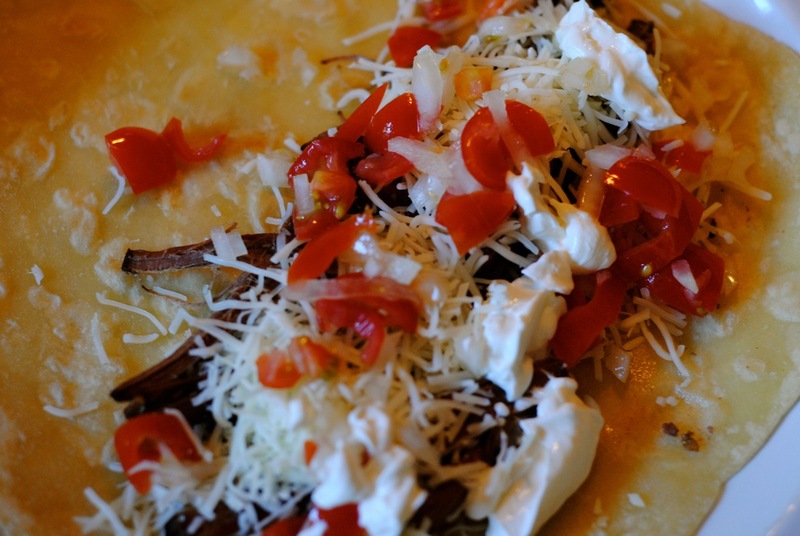 Homemade tortillas are actually dead easy and quick, and if you’re going to go through the effort to make a fabulous brisket filling for your tacos, then you should have excellent tortillas, too. They’re so much more delicious than store – bought (unless you can buy freshly made ones!). SO easy. Flour, salt, water and olive oil. Break off a small ball at a time, roll it out with a rolling pin and throw it in a greased pan for about a minute. It took me about 20 minutes to make 8. Then I served them up. I filled each warm tortilla with brisket (plus a little brisket sauce from the crockpot) some monterey jack cheese, the tomato – onion mixture and some sour cream. If I had had any fresh guacamole I would have used that as well. Et voila! A super delicious, super easy dinner that will wow your family. Sounds so yummy! And who doesn’t love a brisket in any form?